C Harmonica – Why start with a Harmonica in the key of C? C Harmonica – Why a Harmonica in the Key of C? Most beginning players are advised to get a harmonica in the key of C. Those new to music may ask why a C harmonica is needed, rather than another type. Others may ask what is meant by a key of C harmonica. These questions are reasonable, this page answer them. You need a C harmonica because most harmonica instruction books will assume that you have one, to match with the playalong CD. The 81 harmonica lessons at my teaching site Harmonica Academy can (almost) all be done with a just a C harmonica. It is the C major scale, played on a C harmonica. It should sound familiar, and is the “do re me fa so la ti do” which many learnt at school. Music notes are indicated by the alphabet letters A through to G. So the C major scale has C as the first note, and is therefore in the key of C.
It sounds the same as the previous one, except a little higher. Listen to both scales, one after the other. Can you hear the difference? The second scale is a D major scale, played on a D harmonica. This scale has D as the first note, and so is in the key of D. Music is often played in different keys. For example, a female will usually sing a partiuclar song in a different key than a male, as their voices need different starting notes (usually higher for the female). Now that music keys have (hopefully) been explained, we return to the harmonica. 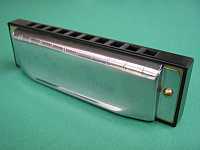 The common 10 hole harmonica is a “diatonic” instrument, meaning that it is designed to play in one key (C for a C harmonica). This also means that some notes are “missing”. For example, if you compare a C harmonica with a piano, the C harmonica can play the white key notes only. Actually there is a technique called bending, which “recovers” these missing notes. However bending is for another day. So, what do harmonica players do when a song is played in a different key? Simple. They just pick up another harmonica, tuned to the key of the new song. Harmonica players therefore carry a set of instruments in different keys, like those shown above. As a beginner you can usually manage your lessons with a single harmonica in the key of C. However when you start playing with other musicians (hopefully you will), then harmonicas in different keys are needed. I remember the pride and anticipation when I bought my first set of harmonica, having newly learnt about music keys. Which harmonica keys should I get? If you are just stating, then your C harmonica will be fine. As you progress, then buy others. If you join in with guitar players (most people do to begin with), then the following 5 harmonica keys will cover most situations: C, D, F, G, A. As your music progresses you will get harmonicas in other keys as well. Many beginning harmonica players want to play blues. As always, you need a harmonica which matches the key of each blues song. However, most blues harmonica is played in second position, where the harmonica key is different to the key of the song. Details about second position blues harmonica are in the lessons at my Harmonica Academy site. But for now, the table below will show which key harmonica to use when playing second position blues. You will soon learn which harmonica to use. In the meantime, write this table on to a business card, and keep it with your harmonicas. When I first started I knew nothing of music keys, and was hence unable to play with others (my harmonica was always in the wrong key). This frustrated me no end, and I was about to quit. Then, at a festival in New Zealand, someone explained music keys, second position, and the need to have harmonicas in different keys. Incredibly, they loaned me their instruments to try out this “new idea”. I was immediately jamming with some guitar players and singers. The festival had a stage with an open mike, we ended up there. I was hooked. I remain forever grateful to the person who explained music keys to me. Hopefully this page will provide similar assistance to other new players.